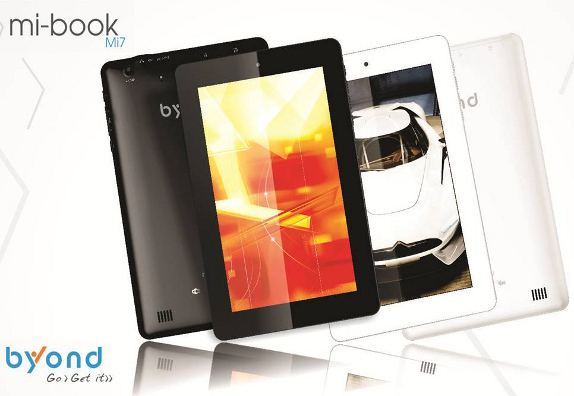 Byond has come up with the new Mi-Book Mi 7, which is a brand new addition to its existing range of tablets. This is the first tablet from Byond which is of 7 inch display. It has a resolution of 1024 * 600 pixels. This is powered by 1.2 GHz Dual Core processor. It has a 512 MB RAM and runs on Android V4.0.4 icecream OS and preloaded office suite. This is an Indian company that is now into cheap manufacture of tablets as now that is what is in great demand. Other specifications are that it is 9.3 mm thick and weighs 344 gms. It has 3 G, Wifi, and Blue tooth. It has 4 GB ROM with 32 GB extendable, with the micro SD slot. Its battery is 3200 MHz. and supports 1080 p video recording. Priced at just 11.500 it will be available with dealers across India as the most affordable tablet. 0 Respones to "BYOND Mi- Book Mi 7"